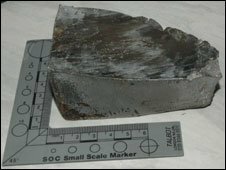 A couple from Hull have been told that a 4lb (1.8kg) chunk of metal which smashed through the roof of their home may have come from space. The RAF investigated the unidentified falling object after it landed in Peter and Mair Welton's loft in July. It was not known where the metal had come from but it seemed likely that it was "space debris", investigators said. The RAF Flight Safety Branch said it was the only incident of this kind it had dealt with for five years. The RAF investigate all objects falling from the sky in case they originate from an RAF aircraft. It was initially thought that the metal may have fallen from an aircraft but tests revealed it had not come from a plane. The investigating team consulted with the European Space Agency and NASA before concluding that the metal was "consistent with space debris", the RAF said. An RAF spokeswoman said: "In the last five years the RAF has become involved in only one incident involving suspected space debris. "If requested the RAF will investigate incidents of space debris but they do not have a standing remit to do so."